Texas State announced today that the Bobcats will wear a throwback to the Southwest Texas days. Good on them. You won National Titles for Pete's sake, wear a throwback, put a banner. Do something. That news inspired us to ponder the five throwbacks we'd like to see from our Roundup squads. Let's start with bringing back the Flying Robotic Owls. These were beauties with the blue lids and white facemasks, all blue home kits. The Owl itself was called the "War Owl" and it's pretty badass with a look of total disregard for any rodent life. It will remind Rice fans of that time Rice finished 0-11. Perhaps we should be more specific, that time in 1982 when Rice went 0-11, not 1989. Or 1968 when Rice lost every game as well. Never let results ruin a good uniform. Sticking in the Mid-80s, the 1984 TCU look is iconic. They took the New York Giants/future ESPN font and made it work. Like everything except the synth-rock, it was simple. A clean two-color purple and white that the Frogs sported throughout the Wacker era. 1984 was the one blip on an otherwise awful era of TCU football. The Frogs rose to 12th in the country and were on the heels of a Cotton Bowl bid. Then Jim Wacker grew a conscious and reported a pay for play scheme and TCU spent another near-decade in the bottom of the SWC barrel. The lesson here kids is if your players are part of a slush fund that's paid out through a local pizza parlor, keep that information to your self. Mean Joe Greene sported some awesome duds when he played for North Texas State. Southwest Conference schools salivated over Greene, but most hadn't integrated. See sometimes you can use racism to your advantage. North Texas did a similar throwback a few years ago but used the power slug logo instead of the "NT Inside the football." It's simple and pretty. 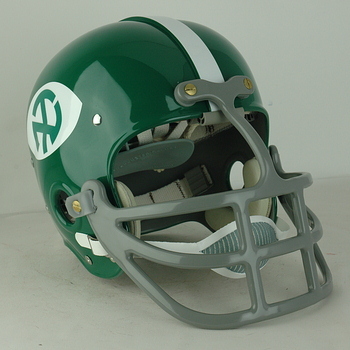 Bonus points for anyone who'll sport Joe Greene's facemask model. Imagine big Joe running after you with that fender protecting his chiclets. Mason Fine and company would look great in these one-offs. Even better if they played Rice with the War Owl set. Excuse me while I feel warm and fuzzy. UTEP fans don't have many fond memories of the David Lee era, but these uniforms are something to behold. The eUTp logo with those shoulder stripes is magnificent. Actually, the white version looked better. The pant and shoulder stripes matched exactly. 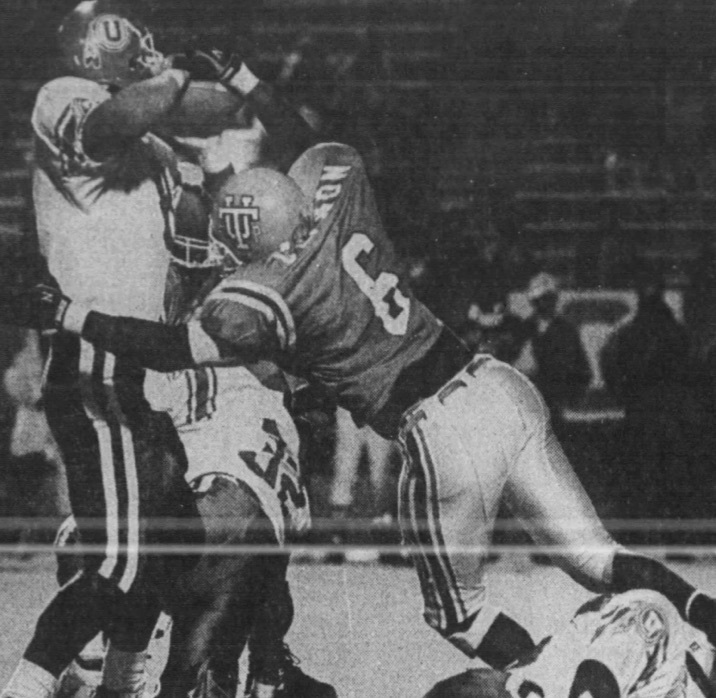 There were the best uniforms in the state back in 1991 and neck and neck with the old San Diego State unis for the best in the WAC. If you want to see how the homies really got down in the 90s google Miami, San Diego State 1990. A football game broke out in the middle of a fist fight. But we digress, bring back the treasures UTEP, wear white at home, it gets warm out in El Paso. 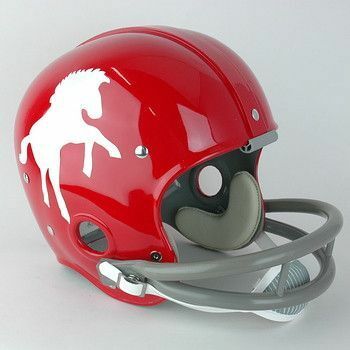 Selfishly, we only want these to see the raggedy original Mustang logo on these beautiful red helmets. SMU's gotten close to these a few times in recent history but without the retro logo. Let's correct that oversight. Here's the great Jerry Levias with the helmet. With the royal blue jerseys and gray pants, these are one of the best looks in SMU history. Of course, the Pony Express era look was our favorite in the early 80s. What are your thoughts? Any suggestions? Write them down, put them in an envelope and place it under your pillow so we'll know where to find it. Posted on August 22, 2018 by The Roundup and filed under North Texas, Rice, SMU, Southwest Round-Up, TCU, Texas State, UTEP and tagged Gear Head Rice Owls North Texas SMU TCU UTEP War Owl Todd Graham Texas State Bobcats Jim Wacker Joe Greene Mason Fine David Lee San Diego State Miami Jerry Levias.